With time winding down on 2015, it’s time to look back and reflect on this past year. Due to a personal loss, we didn’t get to take in a ballpark tour this season, but that didn’t stop us from having some great times, and making some unforgettable memories. Every moment spent with my kids and dad are special, and it’s always difficult to narrow a list down and do every event justice. 9) Meeting Joey Pankake: Picking the #9 slot is sometimes harder than the #1, as it usually means that one special event is left out. 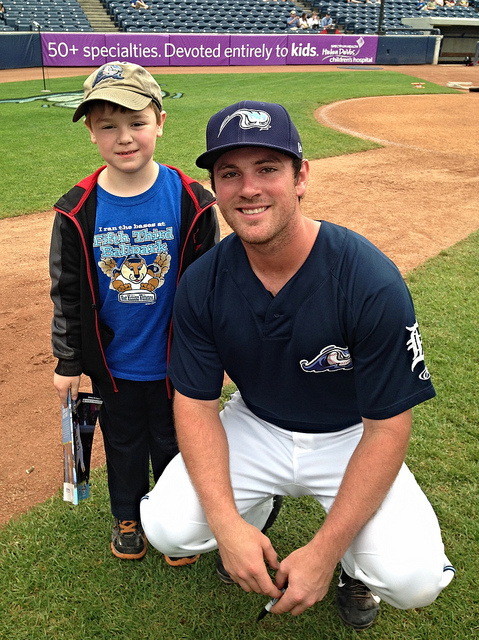 I decided to go with Brian meeting his favorite player in Whitecaps’ second baseman Joey Pankake. We watched him on TV last year when he was playing his college ball with South Carolina, and were excited when the Tigers picked him up in the draft. Every Sunday home game the Whitecaps let the fans on the field to meet the players, so we took advantage of that. Joey was really nice to Brian, as he signed a program for him and got a picture. Times like this is what makes baseball fans. 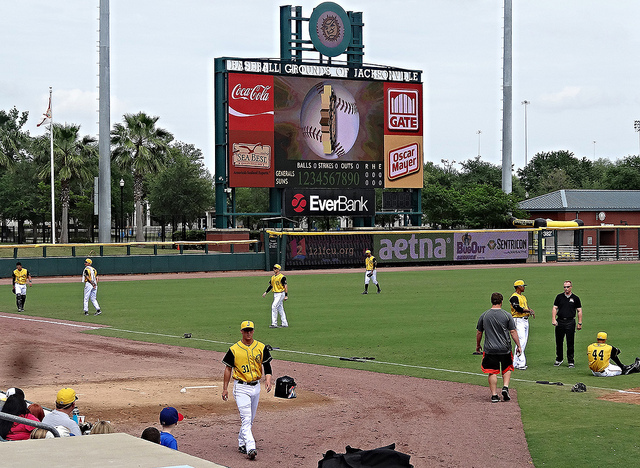 8) Back in Jax: While I was down in southern Georgia doing some training for work in April, I was able to take in a couple of Jacksonville Suns games. The Suns have a great venue, and a game here is always a great experience. Back in 2005 when I was down training for 18 weeks, I went to many games, and the Suns were a positive distraction from missing my kids back home. It was good to be back after a decade, and I hope I don’t have to wait that long to catch another game in Jacksonville. 7) Baseball in Michigan in March: This is an odd pick, I guess, for different reasons. 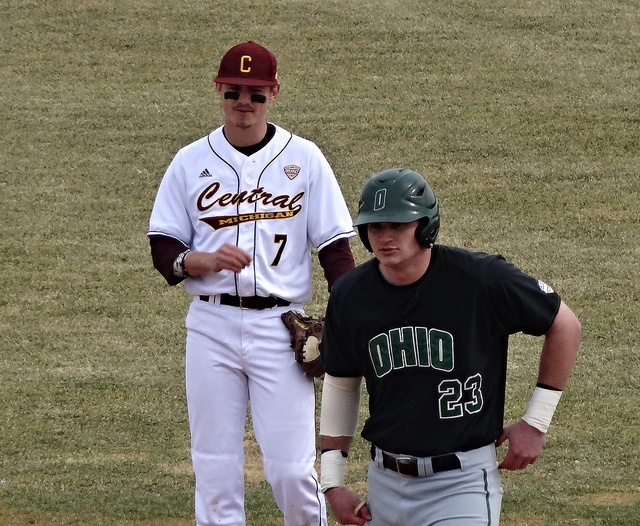 For us, being able to watch live baseball in the month of March is amazing, and we were definitely lucky to be able to take a game as the Central Michigan Chippewas hosted the Ohio Bobcats. On a more somber note, this game was a chance for my dad and I to get out of town and away from things for an afternoon after my mom passed. She loved baseball and CMU, so this was a good place rehash some good memories of her. 5) Playoffs in West Michigan: In September I was able to cross one more thing off my baseball bucket list, attending my first ever playoff game. 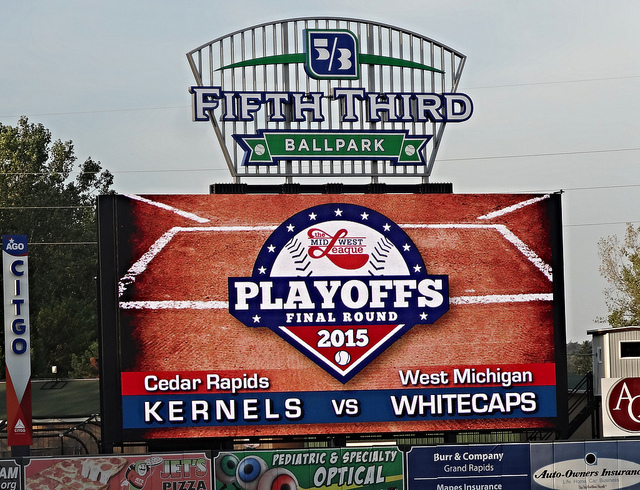 The Whitecaps were hosting the Cedar Rapids Kernels in the Midwest League finals, and were down in the series 1-0. We were able to witness a late come-from-behind victory as the ‘Caps evened the series. It was one of those exciting, high-fiving-total strangers type of game, and it was amazing! West Michigan went on to win two out of three games in Cedar Rapids to secure the championship, and I feel privileged I could be part of the play off run. 4) BTTF Night: This was a great night, and ranks so high probably because this was our first ever Back To The Future night event. Brian had an awesome night, and loved that he was able to sit in the Delorian, pretending to be bolted back to 1985. 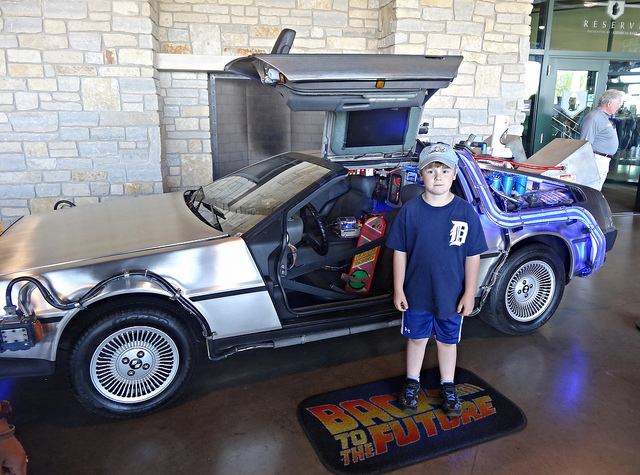 There was a BTTF theme throughout the Great Lakes Loons game, also, with music and games all relating to 1955, 1985, and 2015. Dow Diamond is one of the best ballparks in the minors, also, so just watching the ballgame is very enjoyable. And with a three hour drive before and after the game, was had plenty of time to watch all three BTTF movies during our trip. 3) Brian’s Lugnuts Clinic: For a Little Leaguer having the chance to play some ball on a professional field is quite the experience. Brian was a little intimidated at first when he stepped onto the big field, and the fact that we live so far away he didn’t have any friends in the clinic. Once things got going, though, he was able to relax and just play and have fun, which is the important thing. I hope this was a good experience for him, and that one day he can appreciate being taught the game by professional ballplayers and coaches. 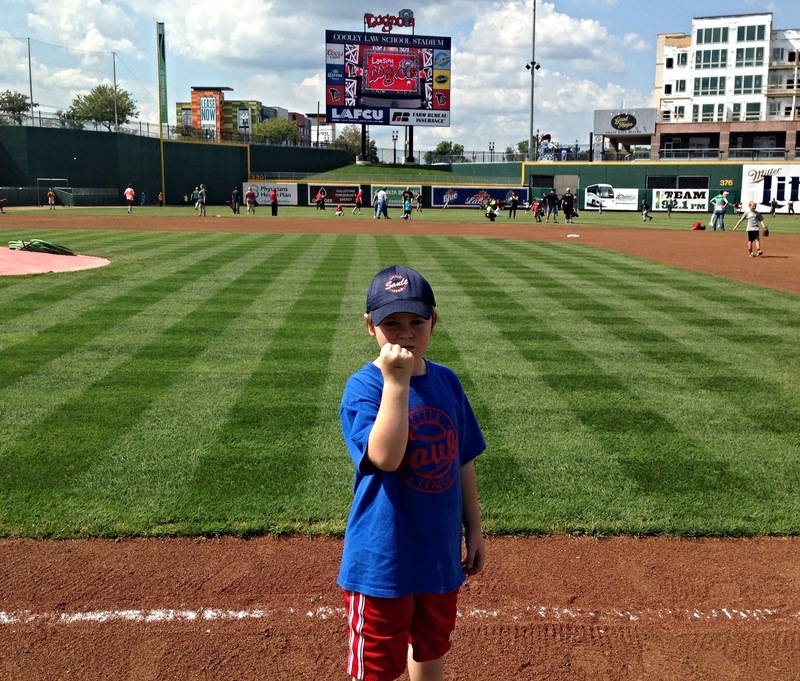 If nothing else, the Lugnuts certainly made another fan. 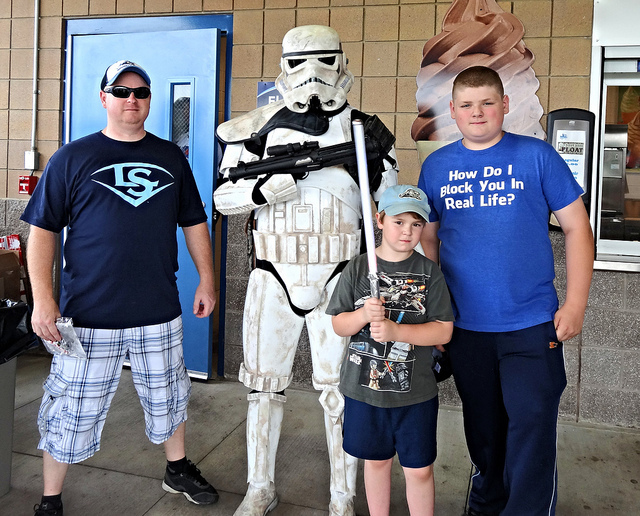 2) Loons Fantasy Camp: This summer I was also able to live out a fantasy I’ve had since being Brian’s age, and that was playing baseball in a professional stadium. 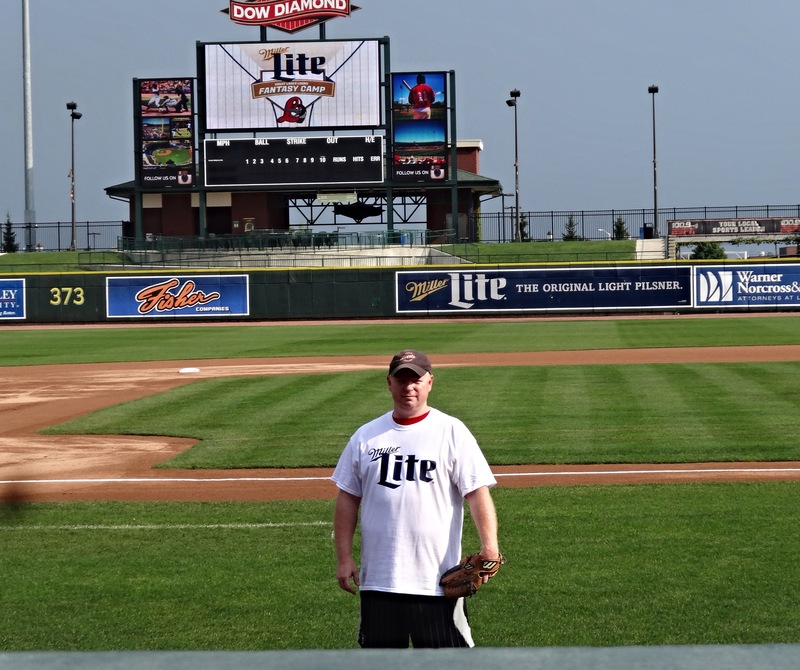 The Great Lakes Loons held a drawing to be able to play in a fantasy game at Dow Diamond, and I was lucky enough to secure a slot. The game was a lot of fun, and I hit the ball well each time up going 1-3. In the field at least I didn’t make any errors and a couple of plays. This was an amazing experience, and having the kids there to cheer me on was just awesome. If any other fans have the opportunity to play in one of these games, I highly recommend it. 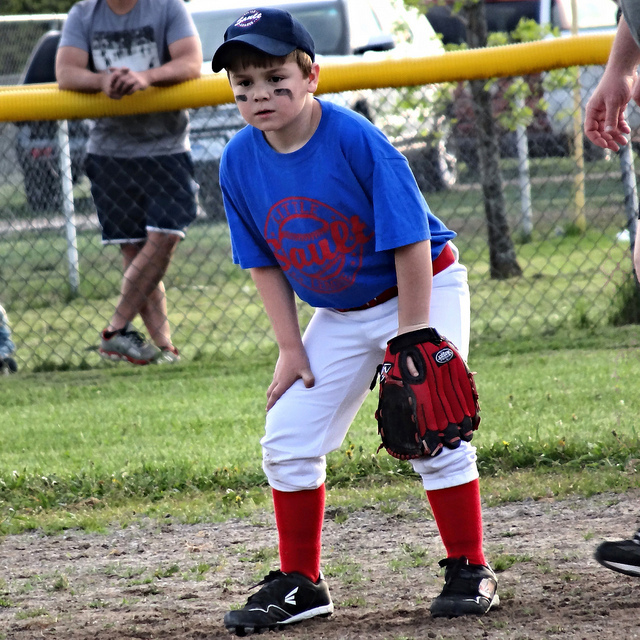 1) Coaching the Cubs: As usual, being able to coach one of my kids in Little League is always number one. Brian and I were members of the Cubs this season, and this was a great team full of great kids. Being able to spend time with him like this is a dream come true, and I love this age level, as I can nurture the kids love of the game while teaching them the basics. No matter how long Brian decides to play this great sport, I will hold on to these years with all my heart and soul. Merry Christmas everyone, and God Bless in the new year!